Pasta Primavera is one of the tastiest ways to eat all your vegetables. Think of it as a “kitchen sink” pasta recipe and load it up with whatever veggies you have on hand, all tossed in the most delicious cream sauce. If there’s a groaning veggie drawer in your refrigerator right now, loaded up with vegetables, but zero inspiration, here’s a genius recipe. 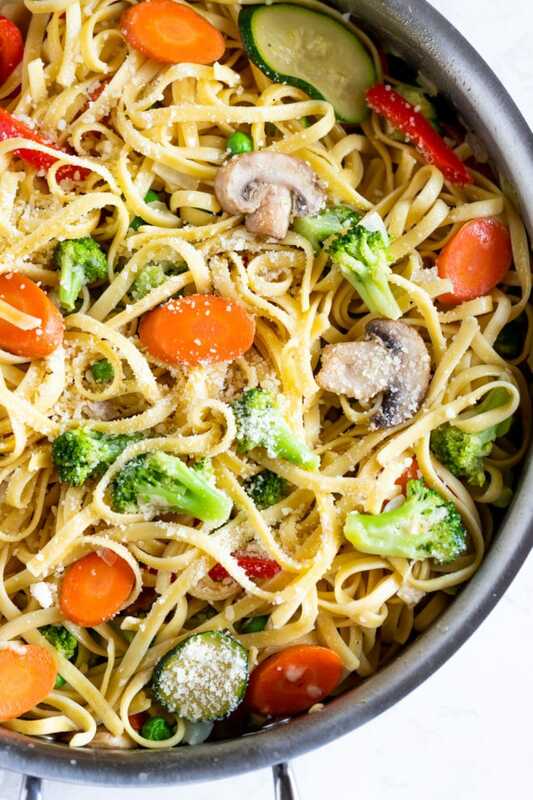 Creamy vegetable pasta is what you should be making for dinner tonight. No ifs, ands, or button mushrooms! In case you’re wondering what vegetables are in Pasta Primavera, the answer is anything and everything! Do you have some leftover Roasted Asparagus, Roasted Carrots, or Roasted Green Beans from earlier in the week? Yes, absolutely, throw them in–you don’t even have to par-cook them first. Those veggies will get covered in the primavera sauce and blend together beautifully. What makes Pasta Primavera so amazing is that you can make it a little differently every time you make it. You can add a little of this and a bit of that, depending on what you have. Fresh spring asparagus, snappy green beans, summer squash…the more fresh vegetables, the better. Making Pasta Primavera for a crowd? Click and slide the number next to “servings” on the recipe card below to adjust the ingredients to match how many you’re feeding—the recipe does the math for you, it’s that easy. In Italian, primavera (pree-muh-VEHR-uh) means ‘spring style;’ in recipes, it refers to fresh vegetables. In this pasta recipe, broccoli, carrots, red pepper, and zucchini are perfect examples of spring vegetables. 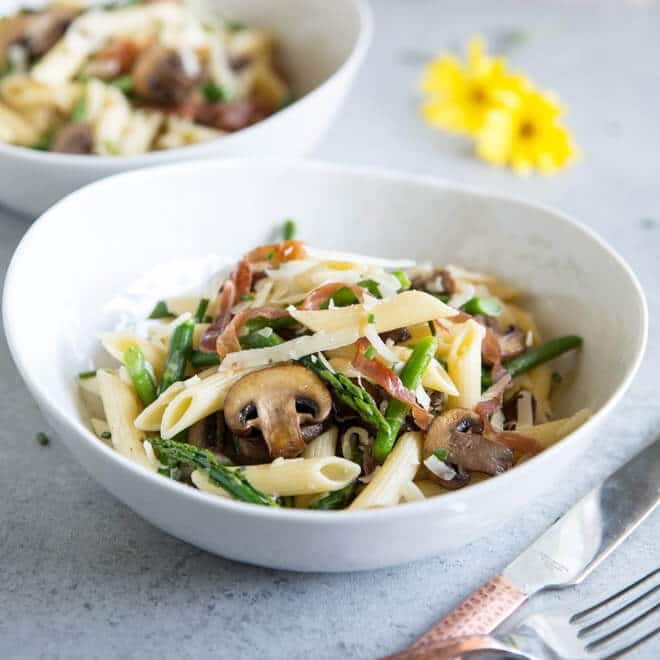 At it’s most basic, Pasta Primavera is a dish where fresh, tender, bite-sized vegetables are front and center. The pasta can be tossed in a lighter, olive-oil-based sauce, or a creamy Alfredo sauce with Parmesan cheese and cream. The recipe has an interesting history. In 1975, Sirio Maccioni, a prominent New York chef, took a job cooking at the summer home of an Italian aristocrat. The summer home was located on Robert’s Island in Nova Scotia. After cooking a lot of heavy and rich game for the guests, everyone cried out for something different, and Pasta Primavera was born. It quickly was introduced to the New York dining scene and became the talk of the town, almost overnight. Along with quiche, fondue, and carrot cake, Pasta Primavera was a standard 1970s menu item. Come to think of it, the 1970s had a lot going on! What’s the difference between Pasta Primavera and Alfredo? With primavera, the focus is on the vegetables themselves. Generally the vegetables used are broccoli, carrots, peas, onions, bell peppers, asparagus, mushrooms, zucchini, and tomatoes. Usually, the dish is tossed in a butter, cream, and Parmesan cheese sauce, like an Alfredo sauce, but it doesn’t have to be—it can be olive oil based, too. Pasta Alfredo such as fettuccine Alfredo, is a creamy sauce that can be made with chicken or other proteins, like my recipe for One Pot Chicken Alfredo. 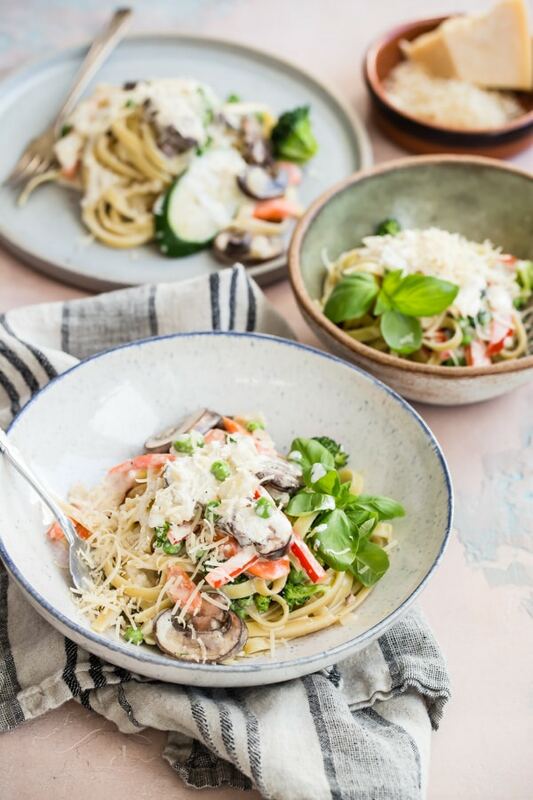 If you’re trying to figure out which creamy pasta recipe to make, Pasta Primavera offers more vegetables, so that’s a good thing! What’s the best pasta for Primavera? The recipe calls for fettuccine, but penne, spaghetti, linguine, bucatini, all work just as well. This is your dinner; it’s hardly time to get strict with the types of pasta. You can even make Pasta Primavera with angel hair pasta. Pro Primavera tip: don’t overcook your veggies. They should be al dente, so they provide texture and flavor to the dish. Plus, they’ll cook once the sauce is added. If you’re using up leftover roasted vegetables, you won’t need to cook them- just add them to the sauce. Making Pasta Primavera is easy. First, cook your pasta in a big pot of boiling salted water. Drain and set aside while you make the sauce. The vegetables cook in stages, starting with the densest vegetables, so that they don’t get soggy. For example, the carrots go into the pan first, then the broccoli, then the peppers. Also, don’t skimp on the seasoning. The veggies might need a little more salt to really make them pop. 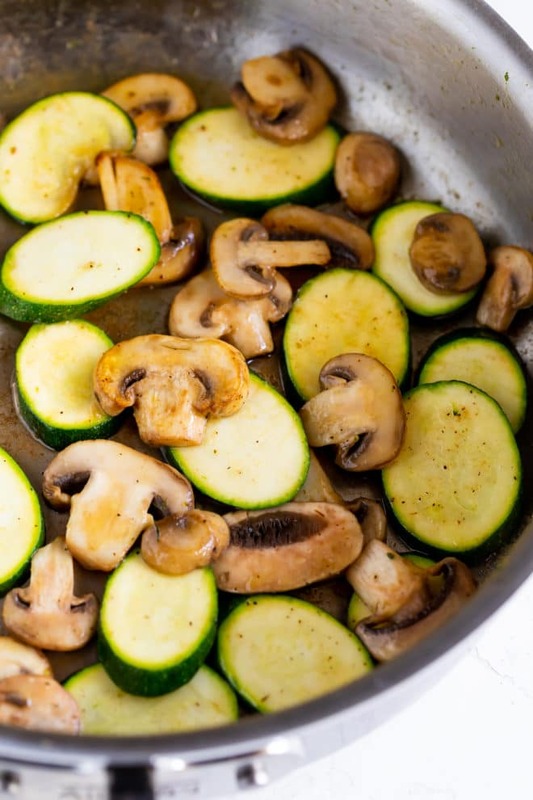 Set aside the vegetables, then sauté the mushrooms and zucchini together. To make the creamy primavera sauce, sauté onions and garlic together in the pan. Pour in broth and white wine and scrape up any browned bits from cooking the vegetables. This will give the cream sauce an added layer of depth. Then stir in the cheese and the cream; stir frequently until the cheese is melted and the mixture thickens somewhat. Season with salt and freshly cracked black pepper. 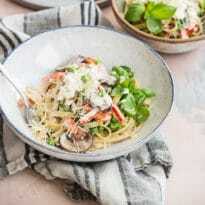 Pasta Primavera with chicken: poached chicken, rotisserie chicken, or even last night’s grilled chicken breast would be top notch in this pasta, especially with the creamy sauce. Pasta Primavera with sausage: turkey sausage, chicken sausage, or milk Italian sausage are all delicious in the pasta for a complete dinner. Pasta Primavera with asparagus: Tender green asparagus, chopped, may be all you really need. 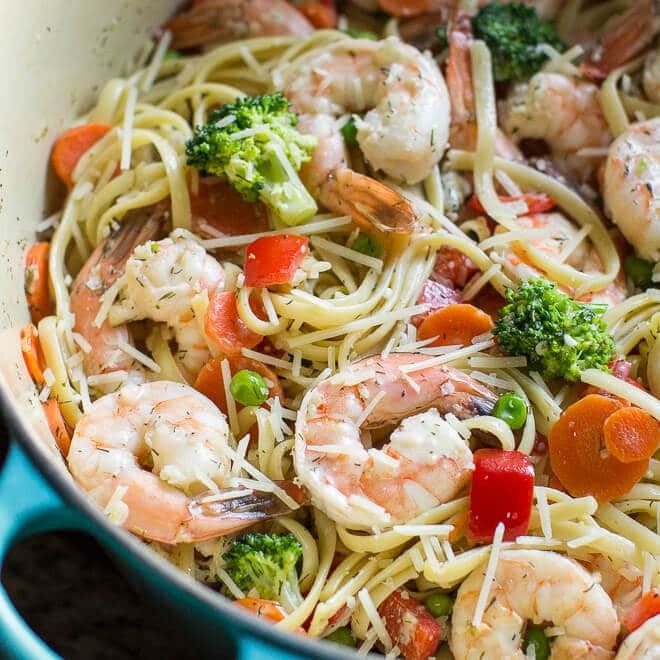 Pasta Primavera with shrimp: rock shrimp or any other bite-sized shrimp are fabulous in this dish! Shrimp make everything better. Pasta Primavera no cream: instead of cream, you can make a light Pasta Primavera using lots of fresh lemon juice and olive oil. And maybe some chili flakes. Pasta Primavera with tomatoes: the first published recipe for Pasta Primavera uses chopped raw tomatoes scattered on top of the pasta, just before serving. If you have some good tomatoes, dice them up and try it. Pasta Primavera vegetarian: substitute vegetable broth for the chicken stock for a hearty vegetarian meal. Pasta Primavera without wine: white wine adds some acid to the recipe to keep the flavors really bright, but it’s totally fine to skip it. Add some fresh lemon juice instead, tasting as you go. Pasta Primavera with nuts: lightly roasted pine nuts or chopped walnuts are phenomenal on this dish, if you have them. Pasta Primavera easy: use up all of last night’s roasted vegetables, or roast all your chopped veggies. Spread them out on a sheet tray for about 10 minutes in an oven set at 450 degrees. Drizzle them in a little olive oil before roasting. Pasta Primavera is one of the tastiest ways to eat all your vegetables. 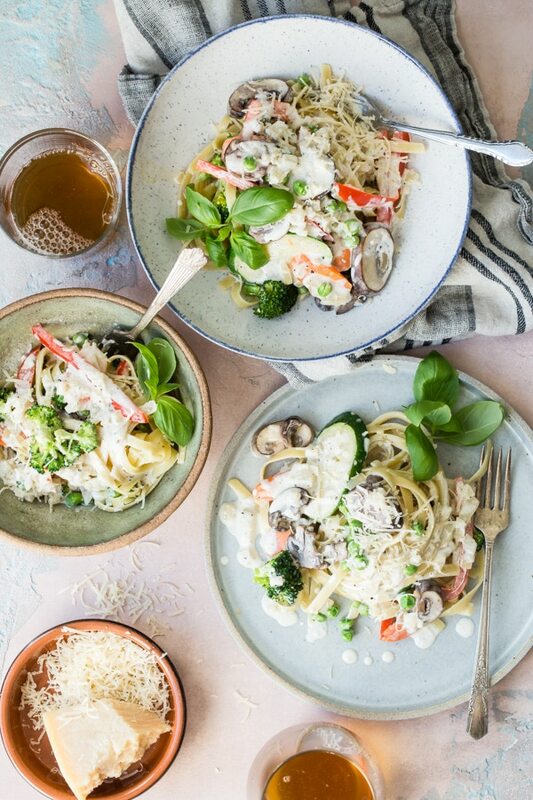 Think of it as a "kitchen sink" pasta recipe and load it up with whatever veggies you have on hand, all tossed in the most delicious cream sauce. Bring 4 quarts water and 1 tablespoon salt to boil. Add fettuccine and cook according to package directions, about 11 to 12 minutes. Drain well. Meanwhile, in a large skillet over medium-high heat, heat olive oil until shimmering. Add carrots and cook 1 minute. Add broccoli and cook 1 minute. Finally, add peppers, sprinkle with salt, and cook 1 minute longer. 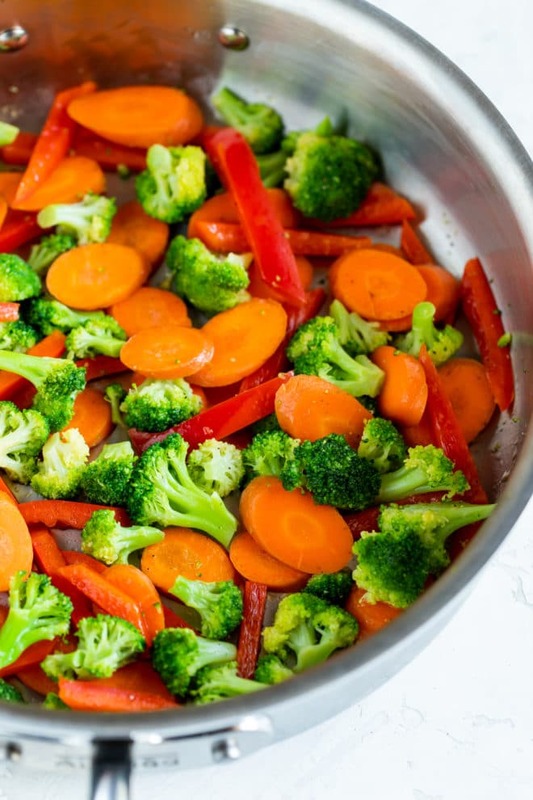 Remove vegetables from skillet and set aside. To the skillet over medium-high heat, add butter and melt until foaming. Add mushrooms and zucchini. Sprinkle with salt and cook until they start to soften, about 2 to 3 minutes. Remove from other skillet and add to carrot mixture. Add olive oil to skillet over medium-high heat and heat until shimmering. Add onions and cook until translucent, about 2 minutes. Stir in garlic until fragrant, about 30 seconds. Stir in chicken broth and wine (if using), scraping up any fond from the bottom of the pan. Cook until reduced by half, about 3 to 4 minutes. 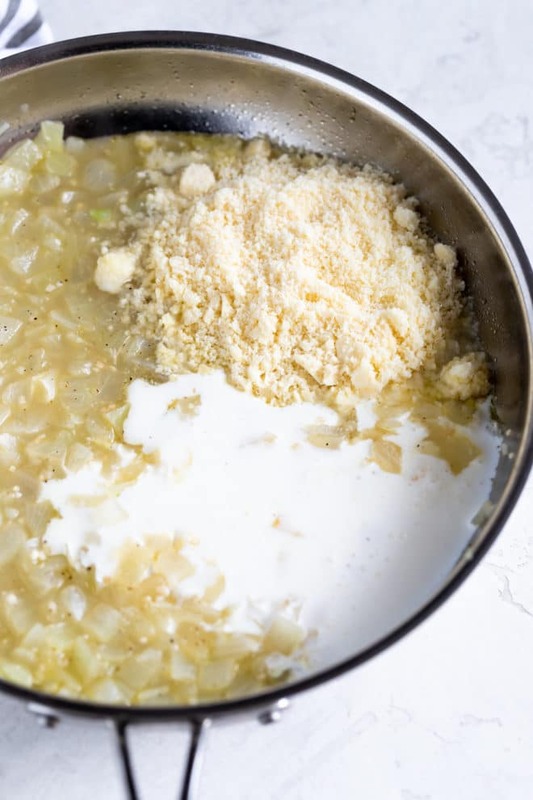 Stir in cream and Parmesan cheese until the cheese is melted. Season to taste with salt and pepper. Stir in cooked vegetables, peas, and basil (if using). In a large bowl or platter, add cooked pasta. Add sauce with vegetables and toss to coat. Garnish with extra parmesan cheese if desired.